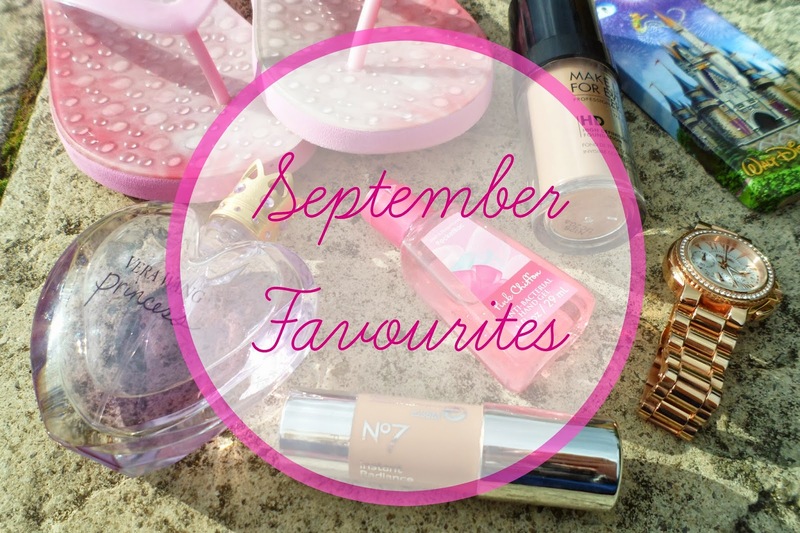 I think this is probably the latest I've ever put up a monthly favourites - I can't believe it's October 12th already! But I couldn't just forget my favourites for September, no sir! I had a few products which really stuck out throughout the month and couldn't not mention them! A few beauty products first! Starting with Vera Wang Princess. A perfume I have wanted for years and years finally made it's way into my collection when I was on my way to Florida! I knew that I wanted to buy a new perfume for my holiday so the scent could always remind me of the trip - sad I now but it does really work - and when I saw this on offer in Gatwick I knew I had to have it! This 50ml bottle was less than £30 and I am so glad I bought it, I smelt fab for my whole holiday and it wasn't until I got to Disneyworld that I realised how perfect the name of the perfume was! Next is the Make-Up Forever HD Foundation. You may have seen me talk about this in my Florida Haul video on Youtube but I had to put it in my favourites for last month too as it is sooo good! I knew I was going to pick this up when I went to the US as it had been on my wishlist for so long and it was the first thing I picked up when I skipped into Sephora! The colour I picked is slightly darker than my skin at the moment but I've been mixing it with my L'oreal true match foundation to bring it down a shade! It is so so good I am obsessed, gives me skin a gorgeous finish plus doesn't feel super thick and heavy like my Mac Studio Sculpt. On holiday I become addicted to this next product. I have already done a review for this No7 highlighter - here - if you want to read more about it, but last month I wore it constantly! It was perfect was my more relaxed minimal make-up look for the daytimes in Florida, it gave me a gorgeous glow and a tint of bronze too! Lastly on the beauty front I've added in Bath & Body Works' Anti-Bac Hand Gels. These are my favourite favourite favourite things to have in my handbag! I was so glad to be able to stock back up on these - only $5 for 5 is something I just can't say no too! I'm hoping all the ones I got last me a while! Last time I went to Disneyworld I spotted this iPhone case but decided to be sensible and save my money (not cheap at about $40) - although I regretted it as soon as I left Orlando! So when I saw it again this time I talked myself into getting the beauty! I have my 5S for another 18months so knew I'd get alot of use out of it! I love it so much, it looks awesome and feels and fits so much better than all those cases I had from eBay! This Watchalicious watch from Folli Follie* has been on my wrist permanently since recieving it. It is the perfect size and shape for me and after having a few links taken out I am so so pleased with how it fits and looks, I actually think I'd be lost without this now! Last but not least I've got some snazzy footwear which I lived in throughout September! You may have seen my talk about these on twitter - they are the flopZ Siam Flip-Flops with pink straps* and they saved my feet on holiday! These flip flops have an amazing massaging gel sole which makes walking feel like a dream - I don't know about you but walking round in flip-flops for me can become really uncomfortable so these are a genius invention! I know it's Autumn now so the time for flip-flops and sandals wearing is diminishing fast but I think I'm even going to start wearing this round the house! flopZ I must high five you on such an amazing creation! I love my Vera Wang perfume but I left it at home when I moved for Uni :( Silly me! I use MUFE HD foundation too! Isn't it so great? And Vera Wang perfumes are my favourites! I have been addicted to the No7 highlighter, never expected a No7 to be that good! Such a beautiful phone case!!! !